The idea of a Three Act structure dates itself as an incomplete understanding of the flow of narrative. From Aristotle to McKee, stories have always been seen as having three movements, or Acts. How can there be anything more to a story than the Beginning, the Middle, and the End? For the longest time, writers everywhere have struggled with the elusive traditional Second Act. They often know how they want to start things out, and they’ve usually got a great idea for a killer ending, but when it comes to all that stuff in the Middle, they can find themselves feeling a bit lost or confused. How do they keep the energy level up for such an extended period of time? Syd Field made things easier with his recognition of the Midpoint, an event that happens directly in the middle of a screenplay. This discovery effectively divided the traditional Second Act into two parts and gave writers welcome relief from narrative exasperation. Blake Snyder reiterated as much in his Save the Cat! series, as did many other experts in story. With the previously insurmountable traditional Second Act divided into two manageable chunks, writers everywhere rejoiced. They finally had a way of trudging through that first draft. But what most failed to see was that their new found ease of movement came more as a result of aligning their writing process with the natural structure of a complete story rather than simply breaking a larger piece into manageable chunks. Rather, writing from the perspective of four movements is closer to what really goes on in the human mind when it attempts to solve a problem. If stories are about solving problems, it only follows that the words will flow effortlessly when brought into line with the natural process of problem-solving. Further explanation requires a journey to murkier and deadlier depths. For millions of avid fans, the first week in August reignites the primal fears of being eaten alive by a remorseless killing machine known as the Great White shark. At the StoryFanatic household, this week long study of deadly dorsal fins and serrated teeth—known affectionately elsewhere as “Shark Week”—culminates with a screening of Steven Spielberg’s 1975 classic, Jaws. What a better way to celebrate terror than with a film that is arguably the Summer’s first-ever blockbuster hit. But does it rate story-wise? While the film is expertly told, it does lack the thematic complexity of say, Hamlet or Amadeus. The shark certainly forces Brody to deal with his personal issues, but is hardly the kind of character the Sheriff can develop a meaningful relationship with, one he can battle on a subjective level. Thus, no real emotional argument is made and the film comes up just short of claiming the label of a complete story. That being said, the purpose of Jaws was to entertain and excite and almost certainly, terrify. For that it was extremely successful (at least in the mid-70s), and whether or not it was told completely pales in comparison to its undeniable success. When all is said and done, Jaws tells the simple story of a man who overcomes his fear of water by having to deal with a shark. There really isn’t much more to it than that. What it does provide, however, is an excellent example of how the problem-solving process moves through four separate Acts. Picking up on last week’s article regarding Plot Points and the Inciting Incident, it is easy to see the partitions separating each Act. The Inciting Incident of Jaws comes with the brutal devouring of “Chrissie” Watkins. That first attack upsets the balance of things in Amityville, thus creating the need for a story. Destroying the shark resolves the problem and ends the story. The three Plot Points between these events amplify the original problem, increasing the inequity caused by the Inciting Incident while simulatenously shifting the focus of the story. What is most interesting about this is not so much how the Plot Points divide the story up equally, as it is about how these events shift the dramatic focus of the film and the intentions of the characters into a new and as of yet, uncharted area. The Plot Points are more than simple markers to keep the script reader interested. They are a changing of the tide and a call for new growth. As mentioned previously, Sheriff Brody (Roy Scheider) has a personal issue with going into the water—he’s terrified of it. He spends a good portion of the story avoiding this fear, doing whatever he can to keep from facing it regardless of the problems it creates for him and those around him. The story, and the Plot Points that propel it forward, move Brody to a point where he can finally overcome that fear by having to face them head-on. Driven by this fear, Brody takes several approaches to dealing with this problem externally. His approach changes with each Act Turn, as it should in response to the shifting dramatic tides going on within the story. It should be noted that the following four stages of approach are NOT in every story, nor do they necessarily reflect accurately what Brody is dealing with personally. The four listed below are merely the different approaches one can take when determining how to deal with a man-eating shark. It is one way to look at the problem-solving process, however one complete way. The following sequence is simply provided as an example of the natural progression that comes when a writer begins to think in terms of four, rather than three. Following the awful demise of Chrissie, Brody is forced into protection mode. In this First Act, he endeavors to safeguard the people of Amity from any further attacks. A character stuck in preservation mode won’t do anything more or less than what it would take to put things back the way they were, almost as if nothing had happened at all. This is reflected in his efforts to make warning signs and his desire to close the beaches. Only problem is, Amity has a Mayor and several city fathers who would rather see their town thrive as it always has on the 4th of July. Having failed to resolve the problem with protection, Brody tries doing nothing in the Second Act. Sure, he argues with the Mayor at the council meeting and at the dock with the captured tiger shark, but when it comes down to it, he spends most of this Act reamining relatively ineffectual. The Kitner kid gets it and Brody responds by getting drunk on wine. This approach of inaction carries itself up to the apparent third “shark” attack, wherein Brody stands shoreline as dozens and dozens of panicked swimmers rush past him. He can’t step into the water, can’t help anyone and even when the real shark threatens his own son, all he can do is stand by and watch. He does nothing to further or hinder the progress of the problem. The severed leg of the poor fisherman falls to the ocean floor and Brody has to change his approach yet again. No longer able to hide behind the guise of protecting, and no longer content with standing idly by at the water’s edge, Brody spends the majority of the Third Act reacting. This is different from preservation in that, when something negative happens, the reactive person attacks the source of the problems rather than try to bring things back to an equitable state regardless of source. When Quint destroys the radio, Brody responds by yelling at him, challenging him to the point of being overreactive. If this had been the Brody of the First Act, he would have tried putting the radio back together. If instead this had been the Brody of the previous act, he wouldn’t have done a thing. But he didn’t because this is the Brody of the Third Act; there is no going back to previous Acts when it comes to character development and plot progression. The human mind doesn’t backtrack when solving problems, and neither should a story. Brody moves into this Third Act focused on responding to the shark as his new approach. The reactive person attacks the source of the problem that attacks them, reacting to what has happened. There is no looking forward, and no anticipation. The shark attacks the boat, chomps down on Quint, and suddenly Brody finds himself propelled into his Fourth and Final Act. Having tried every other approach one can when dealing with a killer shark, Brody is left with one final method: Proaction. This is different from Reaction in that a character won’t wait for something negative to happen first, instead they initiate the action. Sheriff Brody doesn’t wait for the shark to attack first, as Hooper did in the cage, or as Quint did trying to punch his way free of those massive teeth. Instead, the man who was once afraid of water, grabs the gun, climbs the masthead and tells G.W. to flash those pearly whites. It is a natural progression, when trying to determine how to effectively deal with a menacing shark, to move from a point of preservation to inaction to reaction, and finally, to proaction. Whether or not Brody’s final shot rang true or not, every tactical aspect of fighting a monster of the sea had been covered. A completely new story would have to be created to further deal with the problem if the menace had somehow survived. There was nowhere else Brody could have gone. Eagle-eyed storytellers will pick up on the fact that the Act movements in Brody’s development do not correspond exactly with their counterparts in the story at large. His first Act lingers until the Kitner kid’s mom delivers her response and his Third Act lasts forever until Quint meets his bloody end. This is not a mistake. The development of the Main Character does not always sync up precisely with the major Act turns of a story, nor should it. Storytelling is not an exact science; not every progression can be broken down into four 30-minute sections. Sheriff Brody’s development in Jaws is an excellent example of this. It is interesting to note that in Alexandra Sokoloff’s analysis of Jaws (one of the better screenwriting experts out there), Brody’s slap is identified as the First Act Turning Point. There is a difference between the Plot Points that affect everyone and the Plot Points that affect the Main Character personally. His feels more dramatic and more important because one, as an audience we empathize more strongly with his storyline, and two, the dramatic shift between his First Act and Second is more significant and drastic than the shift that happens in the larger story. Regardless of whether or not one sees the separation between the Main Character’s storyline and larger storyline at work (usually called the A-story), Brody’s development does proceed in a natural progression of four stages, each one building upon the failures and successes of the previous. There is a feeling of satisfaction, of contentment, that comes with a story that has covered all the dramatic bases. There are no unanswered questions, no story “holes” for audiences to poke their fingers into, and no lingering feeling of dissatisfaction. 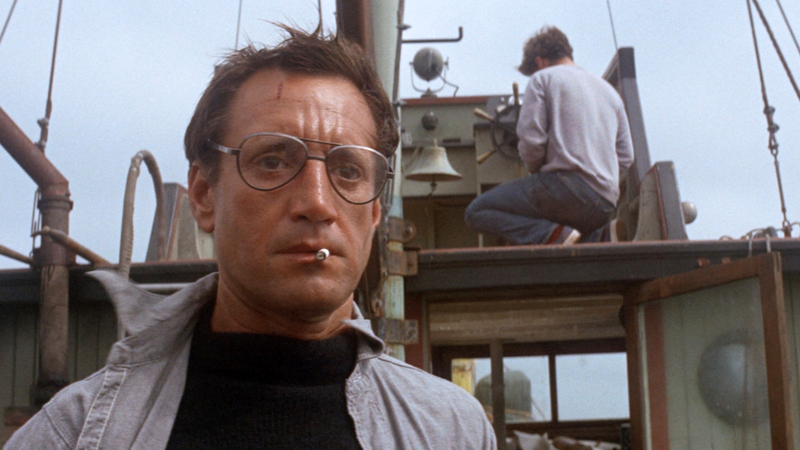 While Jaws is not a literary masterpiece, it does satisfy the audience’s need to have every avenue explored in the context of defeating a killer shark. If Brody had somehow skipped the approach of inaction, as might have happened when thinking of the traditional story paradigm of three acts, there would have been some doubt left in the audience’s mind as to Brody’s growth and the sincerity of his actions. What if he hadn’t done anything?, they would have asked, and the film would have felt less than satisfying. As it so happens, every approach was covered and the film was a massive success. The progression of Four Acts has much to do with that. Plot points and the Acts they form are not devices designed to organize storytelling into 30-page increments. Instead, they help form the carrier wave for the message a writer hopes to impart on their audience. Thinking in terms of four Acts, rather than three, insures that the entire message will be delivered intact. The problem with thinking of “the first half of Second Act” and “the second half of the Second Act” is that a writer is in essence saying both halves are dealing with the same thematic elements, both are parts of the same whole, when the truth is they’re not. They are separate, dramatic movements that should be treated as much. All Acts are created equal in the eyes of a sophisticated writer. Pretty much everything in Dramatica is divided up into fours. The Four Throughlines, the Four Domains, and yes, the Four Acts of each of those Throughlines. The model itself is based on Quad Theory—a super complicated mathematical relationship that many writers needn’t concern themselves with. Suffice it to say that every structural part of a story can be seen from four different contexts, and the model reflects that. Those who look hard enough will find the quad of Preservation (now Protection), Inaction, Reaction and Proaction under the Issue of Strategy in the Physics Domain. This is NOT the OS Quad and certainly not Brody’s MC Quad. It is simply used as a point of reference for looking at Brody’s approach or tactics used when dealing with the shark. When it comes to a character trying to strategize how to deal with a monster, those four Problem elements cover everything. In earlier versions of Dramatica these four elements were seen as part of the Action “Need” Quad, a concept that has now proven to be limited in its scope when it comes to understanding the meaning of a complete story. However, the above analysis can be seen as an example of the flexibility of the current model in appreciating any story, even one that is a tale, a short story or a very simple story as is the case with Jaws.